Dean Gerken is a tall goalkeeper who signed for Bristol City in the summer of 2009 and established himself as the club?s first choice throughout 2009-10, showing himself to be a brave and athletic ?keeper. The arrival of David James at Ashton Gate in the summer of 2010 put his place under threat and despite producing a Man of the Match display in the Carling Cup defeat at Southend, he found himself on the bench for the rest of the season until being given the opportunity to show what he could do in the penultimate game. 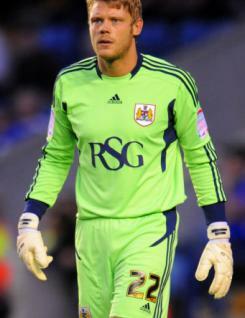 He gave a stirring performance between the sticks at Pride Park, as City brought off a 2-0 success. Dean spent his formative years with Colchester where he worked his way though to gain regular first-team football before his move to the West Country.